This month’s newsletter contains information from our friends at the Secretariat of the Convention on Biological Diversity that the theme of this year’s International Day for Biological Diversity will be “Biodiversity for Sustainable Development”. We would like to inform you of some upcoming events: two events to launch a new DVD produced as part of an IPSI Collaborative Activity; and an International Symposium related to biocultural diversity to be held in Japan. We also have a report from a conference on island biocultural diversity held recently in the Republic of Korea, and an introduction of one of IPSI’s newest members, the Research Centre of the Slovenian Academy of Sciences and Arts (ZRC SAZU). There has also been an announcement of a call for nominations for the IPBES Young Fellows Pilot Programme. Please see below for more details. We hope you will find this newsletter informative, and continue to keep in touch. IPSI partner the Secretariat of the Convention on Biological Diversity (SCBD) has announced that the theme for the International Day for Biological Diversity, to be celebrated on 22 May this year, is “Biodiversity for Sustainable Development”. The IPSI Secretariat is encouraged to see the connection between biodiversity and sustainable development receive this sort of attention, since both are major components of the Satoyama Initiative. Events will be held in various locations on and around 22 May. See the CBD website here for more information about events near you. As we mentioned in last month’s newsletter, one of IPSI’s Collaborative Activities recently produced videos about the revitalization of the Urato Islands in northeastern Japan after the major earthquake and tsunami in 2011. The new videos, as well as being available for viewing online, are also collected on a DVD published as a component of the activity. at Fureai ESP Hall in Shiogama City, near the Urato Islands in northeastern Japan on 16 May; and at United Nations University headquarters in Tokyo on 2 June. Both events will be conducted in Japanese. For more information on registration, etc., please feel free to contact the IPSI Secretariat. The United Nations University Institute for the Advanced Study of Sustainabilty Operating Unit Ishikawa/Kanazawa (UNU-IAS OUIK) will hold an international symposium on 28 May, titled “Introducing the Ishikawa–Kanazawa Biocultural Region: A Model for Linkages between Cultural Prosperity and Surrounding Satoyama and Satoumi Areas”. The event is being planned to take advantage of the IX Annual Meeting of the UNESCO Creative Cities Network (UCCN), which will take place in Kanazawa, Japan (a designated UNESCO City of Crafts and Folk Art since 2009), from 25 to 28 May 2015. Both UNESCO and UNU are IPSI members, so we expect this to be a productive event for the IPSI partnership. The symposium will feature presentations from close friends of IPSI from around the world on how ecosystem services are associated with interrelated cultural and biological diversity. For more information and instructions for registration, please click here. 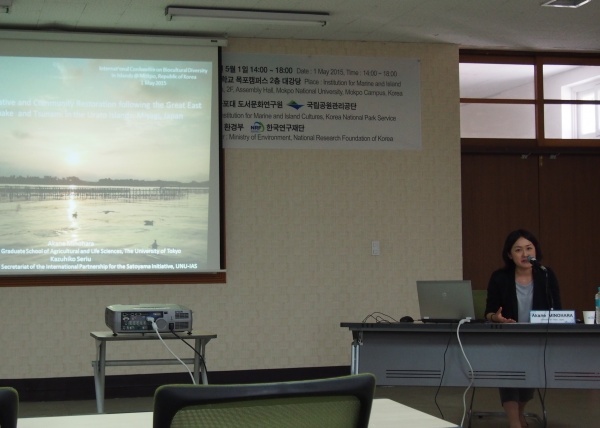 An International Conference on the Importance and Significance of Biocultural Diversity in Islands was held from 1-2 May by IPSI member the Institution for Marine and Island Cultures (MIC) of Mokpo National University in Mokpo, Republic of Korea. IPSI Secretariat staff attended the event, and were pleased to meet up with and hear presentations from many friends and IPSI members including Prof. Jae-Eun Kim from MIC, representatives from IUCN, and Ms. Akane Minohara of the University of Tokyo, whom many readers will remember as former IPSI Secretariat staff. A main outcome of the workshop was the initial announcement of a planned new Global Island Biocultural Diversity Initiative to be headed up by MIC. The planners of the initiative expect the IUCN World Conservation Congress (WCC) in Hawaii in 2016 to be a major milestone. IPSI also plans to have a major presence at the WCC, and looks forward to collaborating with the new initiative and many other IPSI members leading up to that event. 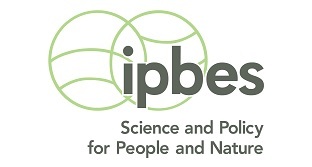 The IPBES Secretariat has put out a call for nominations of fellows for the IPBES Young Fellows Pilot Programme, following up on the outcome of the third session of the Plenary (Decision IPBES/3/1). The pilot programme is targeting young scholars who wish to gain experience by participating in the development of the regional and sub-regional assessments (Africa, Americas, Asia-Pacific and Europe and Central Asia) or the thematic assessment on land degradation and restoration. Selected fellows will take part as contributing authors to the chapter of the assessment they are selected for. Member States and Observers are invited to disseminate this call to relevant institutions and organisations for their direct nomination of candidates to this programme. The IPSI Secretariat itself will not be a nominator, but we encourage those interested to contact their relevant nominating organization (e.g. their national government). The deadline to fill out the application form is 31 May, and 5 June for nominators to submit nominations. Please see the IPBES webpage here for the full announcement. The Research Centre of the Slovenian Academy of Sciences and Arts (ZRC SAZU) is the leading Slovenian research centre in the humanities and a cutting-edge academic institution in Central, East and Southeast Europe. Its basic mission is to conduct basic research as part of national research programmes, national basic research projects, international projects, and excellence centres. ZRC SAZU also carries out a series of applied projects that exceed the narrow orientation of individual specialized areas and make possible valuable links between various institutes and disciplines. Thus it has a multidisciplinary and interdisciplinary character; in addition to the humanities, its spheres of research also cover the natural and social sciences. It has broad experience with conducting research on a variety of topics especially on cultivating, preserving, protecting, managing, and developing strategies for a responsible attitude towards Slovenian natural and cultural heritage, among which cultural landscapes have a special place. ZRC SAZU has its own publishing house, bookstore, and audio-visual laboratory; it houses the Geographical Museum, and boasts numerous collections. ZRC SAZU encompasses 18 research institutes in the fields of Slovenian language, Geography, History of Art, Anthropological and spatial studies, Archaeology, Cultural and memory studies, Cultural history, Ethnomusicology, Musicology, Philosophy, Slovenian Ethnology, Slovenian Literature and Literary Studies, Palaeontology, Biology, Karst research, History, Slovenian migrations and Sociomedical studies. Researchers also conduct studies at three regional research stations which connect the research network across Slovenia from west to east. Additional information about ZRC SAZU can be found at http://www.zrc-sazu.si/en/strani/about-zrc-sazu. 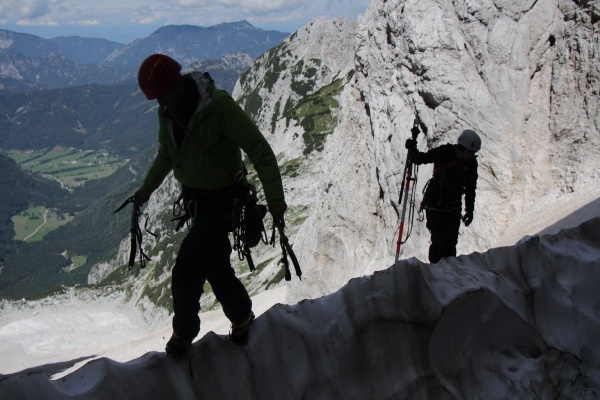 The photo below shows ZRC-SAZU researchers at work high above a production landscape in Slovenia.